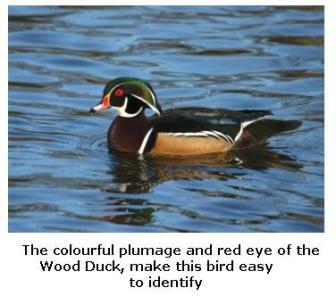 The beautiful Wood Duck can be found in wetlands all over Southern Ontario as their breeding grounds extend from Ontario to Florida. Endangered a hundred years ago because of hunting and habitat loss, these ducks are now in Southern Ontario in healthy, sustainable numbers. This is considered to be a "Perching Duck", meaning that although this bird feeds on the surface of the water, it tends to perch and build its nests in the holes of trees, rather than on the ground. The colouration of the young reflects this, as they are light below and dark above, which is unlike the duckings of other species, which tend to be fluffy yellow all over. These birds are a little smaller than a Mallard and smaller than a Teal and are around 19" in length and have a 29" wingspan. 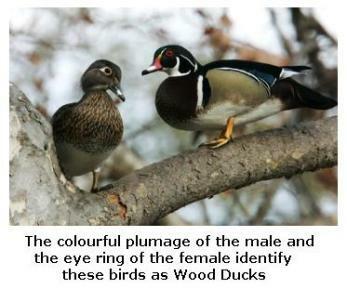 Easily identifiable by their bright, red eyes and colourful plumage, the male is more brightly coloured than the female and the female has a white eye-ring. Females often lay around 10 - 14 eggs in a nest which is built over water, as the young are precocial and are able to walk, swim and find their own food when they leap out of the nest, just one day after hatching! Building their nest over water ensures that the ducklings have a soft, wet, landing when they leave the nest! These birds, however, sometimes build their nests up to 150 yards from water, but water-front property is preferred! Females sometimes engage in the behaviour known as "Nest Dumping" where several females will lay their eggs in a communal nest, but this leads to lower hatching rates and fewer live young. When we kept Muscovy Ducks for a time, our four females laid their eggs in one nest, but for them it was successful as from a total of 30 eggs, 24 were successfully hatched and raised by one mother Duck, although the ducklings actually had different mothers, one duck had the task of raising them. These birds are omnivorous as they eat insects, in addition to seeds and berries. Wood Ducks can be encouraged to nest if nesting boxes are places near bodies of water such as irrigation ponds and small lakes.